Happeo allows 3 types of pages, which affect how the page navigation looks and how Happeo behaves when you log in. Whether a page is a Primary Page, Secondary Page or a Normal Page, users will only see what has been shared with them. Primary page is also called the Home Page. It is the Primary Page of the organisation and is promoted in the Pages navigation to the top of the list with a home icon. If you have set your Happeo to "Classical mode" in the Happeo General settings, all users will land to this page. We therefore recommend sharing this page with everyone in the domain. Important: If a user does not have access to the Primary Page, they won't see it in the navigation. Also they will be routed to the Secondary Pages if Happeo is in "Classical mode". 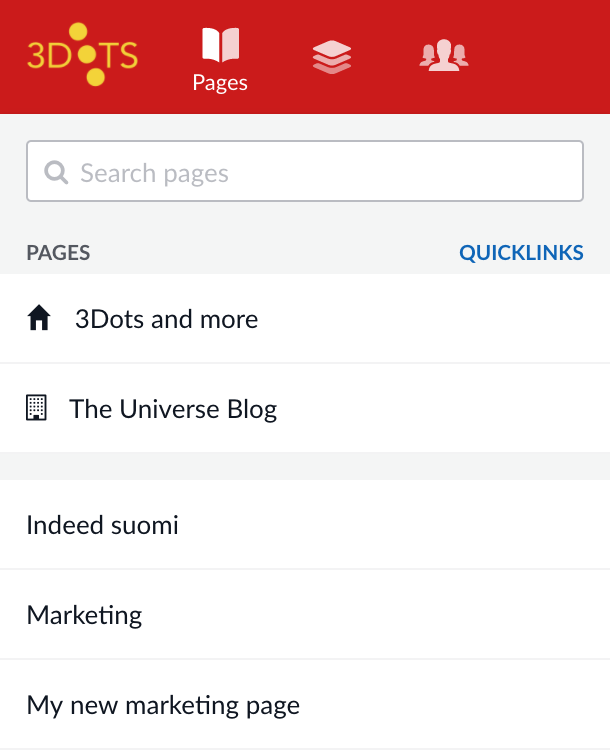 Secondary Pages are promoted just under the Primary Page in the Pages navigation and marked with the business icon. If you have set your Happeo to "Classical mode" in the Happeo General settings and a user does not have access to the Primary Page, users will be routed to a Secondary Page. Important: If your Happeo is in "Classical mode" and a user does not have access to Primary or any Secondary pages, they will be routed to My Stream. Normal pages behave just as normal pages do, they are presented in the Pages navigation in alphabetical order.